Aviation Megastore is happy to announce its Hold & Store service © for internet customers that wish to combine several individual orders to one single shipment, reducing the overall shipping cost significantly. Click here to subscribe to our newsletter! Reduced shipping charge may be applicable depending on country of destination and contents of shopping cart. Will be shown before checkout. This product was added to our database on Friday 29 March 2019. VFR aeronautical chart for France 1:1 000 000 from Editerra. The version JOUR allows you to fly all the days of the week with all the AIP info. All the info you may need for your VFR flight in France (included ultralights, para-drooping areas...). Clear design, double-sided printed, class airspace from A to E up to FL105. Printed in high resistant and laminated quality paper. The AIR MILLION charts are conceived and realised by our team of cartographers, in close collaboration with aeronautical industry professionals. 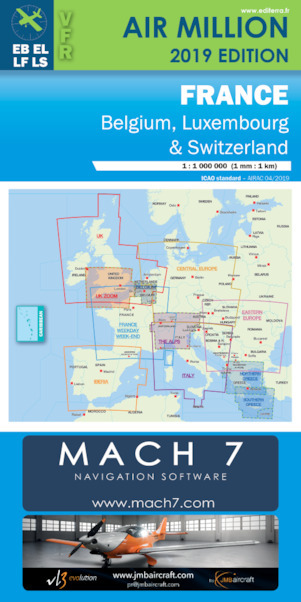 This valuable resource will allow pilots from all over Europe to travel great distances, from Ireland to Slovenia or from Germany to Portugal all on one style and chart layout. In total, thirteen countries are covered in this range. At a scale of 1 : 1 000 000, our charts are printed and laminated on both sides and contain the AIP essential for pilots. None of the aerodromes, airspaces, navigational aids, VRP, VFR routes or obstacles have been compromised, a great number have however been enhanced. The essential information for daylight VFR is on the chart, included all class E airspaces and the smallest zones. Furthermore, a number of ultralight and private airfields are introduced to offer you the greatest flexibility during flight planning. Shop near Amsterdam-Schiphol Airport. LOOK INSIDE !